I can’t believe that it isn’t more people that are using nvALT for note taking, blogging and writing. It’s awesome for that. You don’t have to pay money for an excellent Markdown text editor, nvALT is free. Only available for Mac. It’s great for storing and syncing all your plain text files and notes. You can get to them from anywhere, on any device. All thanks to Dropbox syncing. You can choose to sync with Simplenote if you prefer that instead. I use Dropbox. Another great thing with nvALT is that there is so many cool tools available for it, bookmarklets, browser extensions and more. You can also very easy convert a webpage to Markdown by just doing a simple drag and drop of the open url in your Web Browser to nvALT. Works great and it’s very fast. nvALT ask has a good distraction free mode that makes it a pleasure to write longer pieces in, and it also has a built in preview mode, where you can preview your Markdown and see how it looks fully formatted. 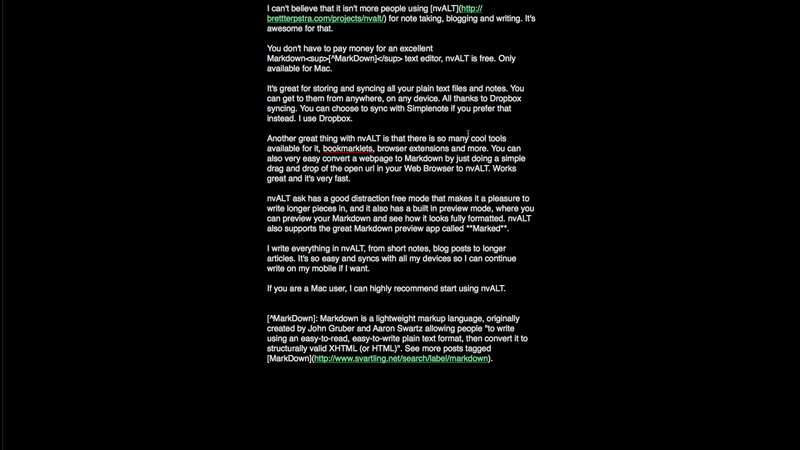 nvALT also supports the great Markdown preview app called Marked. I write everything in nvALT, from short notes, blog posts to longer articles. It’s so easy and syncs with all my devices so I can continue write on my mobile if I want. 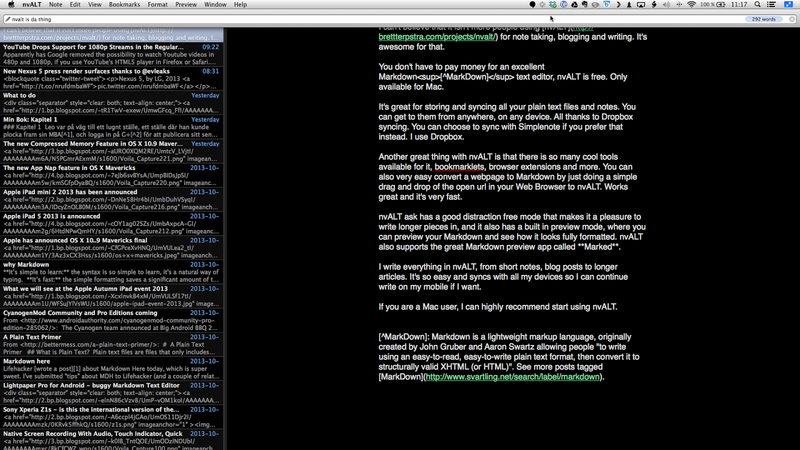 If you are a Mac user, I can highly recommend start using nvALT.